Creating an elegant and traditional design in the bedroom, the Varada bed collection is your perfect choice. 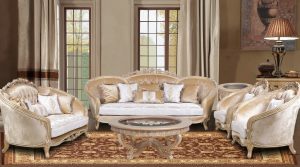 Featuring vintage bone upholstery both on the bed and case goods, also the button tufted headboard and footboard, Combining with the nailhead trim decoration on case goods, your master bedroom will not be monotonous. This luxury style collection is available in two finishes!